Increase the productivity of your baking operation by speeding up prep time and shortening cleanup with these convenient pre-cut 8" round dry wax parchment pan liners for cakes. Using parchment paper eliminates the need for grease, and it allows you to remove your cakes after baking with greater ease. Unlike sheets of parchment that you have to cut, these round liners are ready to go right away, saving you time on cutting out individual pieces. Simply place the parchment liner on the bottom of your pan and you're ready to start baking. They're ideal for businesses that produce high volumes of the same size cakes. Each 8" dry wax cake circle is highly grease and moisture resistant, so you'll be able to release your cakes neatly and without hassle, making cleanup a breeze! LOVE, LOVE, LOVE these! Every baker should have these in their kitchen. Worth every cent and then some. Makes cake turn outs easy with absolutely no problems. These sheets are excellent. They save a lot of time when baking and they’re also great to use on cake acrylic discs for icing cakes. I have them in 5 sizes and they last a long time. These are great! No more cutting the circles put. So convenient and very good deal on these compared to most places! Love them alot. A must buy! These parchment sheets are a HUGE time saver! I used to trace and cut every liner for the bottoms of pans. I wish I discovered these years earlier. Just spray with Pam and put in the bottom of your cake pans for easy release! Very good dry wax parchment liners. Good quality and very easy to remove which makes our jobs a lot easier . Serves it's purpose Our staff love them. A life saver in any bakery, makes prepping cake pans a whole lot easier and faster. The box they come in is perfect for storage and they are not greasy which I am happy about. These are an absolute must have at my bakery. I think back to the first few years of cutting circles out before I saw these.. what a waste of time that was! These are great and reusable if you are baking cake after cake the same day. LOVE them!! Perfect size for the Wilton brand 8 inch cake pans, does it job of keeping the bottom of your cake from sticking to bottom of pan. These parchment circles were so worth the money. They are a huge time saver and actually save you money because they are much cheaper than buying rolls of parchment and cutting circles out yourself. Totally transformed my cake making process! I love these round liners. One of the things I hate the most about baking cakes is having to cut out circles from parchment paper rolls. This makes it so much easier since all the work is done for you. They work very well and I have never had any cakes stick to it, it's a great bargain as well. They fit all my 8 in cake pans perfectly, I have had no issues with this at all. They come packaged in a box which makes for easy storage. I highly recommend these liners. These dry wax parchment pan liners help me produce a uniformly baked cake every single time. The ease of use is definitely worth the price. Wax paper circle fits perfectly on the same sized pan! I have a couple different sizes and I love them! They definitely make baking and preparing for a big project much easier. I use these in my springform pans for cheesecakes and I’ve overed them in 6 inch, 8 Inch and 9 inch and I love the way they work. Not cheap material. When you make a lot of cakes these are great to have on hand. It sure beats greasing and flouring pans over and over. They are true to size, too. Very helpful product and definitely a time saver. No more cutting and wasting parchment paper. This size will also be good for a 9 inch round pan. Awesome product. I have bought five different sizes of these as they perform perfectly everytime. Easy release no clean up and saves time. Seriously, what else could you ask for? These work perfectly with the 8 inch pans. I also use them with my square pans. They come in a plain box with a perforated area for easy access. I use these liners for cakes while baking and I use them as separators when I freeze items that I don't want to stick in the bags. No more wasting time trying to cut up large sheets of parchment into circles or spending more at the craft stores for pre-cut sheets. These are convenient and so worth the money. This saves a lot of time. I used to have to cut out a circle for my cake pans, but now I’ve found these things are a lot smoother. Also available in larger sizes. Love these makes things a little easier when making cakes and the price is great. I will definitely be ordering them in the larger size also. These 8" round parchment pan liners make baking cakes so much easier! The cake releases smoothly from the pan and the clean up is so much easier when we use these liners! We use this size frequently for birthday and occasion cakes. I have various sizes of these round parchment sheets. They make my life & time so much easier. They fit perfectly into my cake pan (the size of the parchment. Fits the same size cake pan). Just place a sheet into the bottom of cake pan. It’s already cut to fit perfectly. Pour batter. Bake. Let pan cool down. Flip cake pan upside down. Cake comes out with ease. Easily peel off parchment sheet. Then dispose parchment sheet. The cake looks beautiful. Can not beat the price. The price of convenient. These parchment rounds are actually a bit large for my 8 inch round pans. I can easily use them in my 9 inch pans as well which is nice. I’m going to order these in every size. It’s a no brainer for any Baker it makes baking cakes so much easier with the cake sticking to the pan. Hum, the price. Some may say they rather just cut their own parchment circles. I admit, I have at times decided to just cut my own. You can do that or you can just grab and bake. These liners really are a time-saver which, in my mind, is a money saver. Worth it. These liners are so fantastic! They are a terrific value, great quality, and easy to use. We love sending them to our clients. They're perfect! Works how parchment should work. It fits in the cake perfectly and the cakes free it self easily from the pan. This is a great buy at a cheap cost. I love these parchment circles! They make baking cakes so easy. You don't have to waste time cutting out your own circles and trying to get your cakes out of their pans. 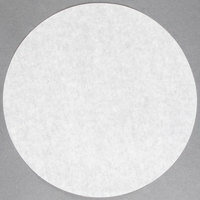 I mean... what can you really say about parchment paper circles? Saves me a ton of time compared to cutting all of my own for the bottom of cake pans and the price is totally reasonable. Definitely worth it! These fit my 8 inch and 9 inch wilton cake baking rounds/pans. No matter which batter (pineapple, carrot) I use-- I am never worried about the bottom sticking. These are a must for baking. I also use these to separate things from freezing together--like pancakes! The pack is huge, but these are such time savers. I use them to line every cake pan when baking, and it just ensure that the cake will come out, even if the side get stuck. Great to reach and grab one of these instead of having to stop and cut one. The prices is so reasonable and the product so convenient. Have never had a cake stick with these! I was so tired of having to cut out all my parchment rounds. I am so glad I decided to finally order these. It is so much easier to just pull one out and pop it in the pan. These are amazing for preventing sticking on the bottom of the pan. They are also super convenient as you don't have to trim them to size. I do prep the pan with non-stick baking spray before and after I put these in. I purchased these to use for lining my cake pans. I have always cut parchment paper to fit the pans but this makes it so much easier. Love these parchment pan liners! WIsh I had discovered them sooner. We no longer have to spend time cutting large papers for our cakes. Saves so much time and waste. Well worth the cost to have the pre-cut parchment for our baking pans!! They meet our needs and we will certainly be ordering them again. I LOVE using parchment paper but always struggled with forming them for the round pans. I would also end up with so much wasted excess paper. These rounds are awesome! You will wonder how you ever did without them. These are easy to use cake pan liners. They are a great time saver, no more trying to cut cake circles from parchment sheets. You can use them straight from the box in your pans before you bake your cakes. The cakes come out really easy and you don't have to worry about some cake sticking to the bottom of the pan. I highly recommend this product. I "splurged" on these. I didn't technically need them- I normally just cut circles out of large sheets of parchment. It's so nice to be able to just grab a pre- cut circle, and not have to do that extra step. So happy with this purchase. I bought the 8" dry wax parchment paper cake liners since I bake a lot of cakes and in the past I would cut out my own, but that produced a lot of waste and took up a lot of time. And then I found those inserts. They are absolutely the best. I use them all the time now. Such a time saver. They are so easy to take off, no mater what kinda cake it is. They do not rip easily either. Definitely recomend. This is a must have size wax parchment pan liner. I don't have to use spray and flour for my pans now. With a quick pan spray and this parchment liner, you don't need flour any more! Way easier to clean up too! These 8" round dry wax parchment pan liners are a great time saver. Most of my round pans are wilton brand. These liners are just a tad larger than the base of my pans so they come up on the side of the pan just a bit. Not a big deal for me but maybe for others. I will buy again. I used to cut my own paper liners for my cake pans. I decided to try these and won't ever go back to cutting my own again. Great time saver and they work great! Gone are the days of measuring parchment paper to your pans and then clumsily cutting them out with scissors! this saves you so much time.. Awesome! Instead of cutting circles with parchment paper all the time, this saves paper! No waste! Webstaurant has so many great items! Must get for cakes! Love these parchment circles! Timesaving and convenient for lining my cake pans. I use them the most for thin layers of sponge cake, it keeps them from breaking when you turn them out of the pan. Will definitely reorder. This I can describe as the best tool when I'm baking tons of cakes. First it's precut, second the quality of this is so awesome! These little things make baking a breeze! Cakes come right out of the pan! I don't even have to grease the sides. So happy to purchase these! These parchment circles are amazing! They fit well into the pans as well as making the cakes come out of the pans super easy! These make baking much easier! The sheets fit my pans perfectly. I even use the 8 and the 10 that I also bought, to line up my pans to bake sheet cakes when I am out of time or out of the straight edge parchment paper. These 8" Round Dry Wax Parchment Pan Liner - 1000 / Case are easy to use and very convenient instead of using shortening and flour just use a non-stick spray. These 8" Round Dry Wax Parchment Pan Liner - 1000 / Case are really great. its so amazing beach it allows your cakes to pop right out of the pan without the hassle or mess. great product! these are perfect fit to go under 6 or 8 inch cakes make your products look nicer, they also protect bottom of box from sticking to your cakes or what ever you put on them. The 1000 case was impossible to find anywhere but here, and the amount of cakes we put out, it was definitely needed. There's no need for spray with these parchment circles.. they work great. I felt that cutting my own rounds was being rather wasteful, so I picked these up to try. They work great and fit my pans perfectly! These liners to the trick. I still spray the pan but the liners them selves work great. After while I will just use the liners and I'm sure that will be enough. I never thought I would order these when I can "just cut out my own!" until I realized how much paper and time I was wasting. These make the job a snap. These parchment pan liners are really great. It saves a lot of time from having to cut them out myself every time i bake a cake. These parchment circles really prevent cakes from sticking to the pan...I don't know how I ever baked without them. These come in a box of 1000, but the box acts as a dispenser. These are the best price I could find. These fit wilton cake pans a little snug, they go up the sides off the pan a little bit. i still fully recommend them for cake pans for easier cake extraction. Easy. Convenient. I love the ease of just placing them in the pans and not having to cut or adjust. With just a little spray, they peel off easily and produce a beautiful cake. These work so well, they fit perfectly in my pan and peels off cake nice and easy. I Will definitely be ordering these again when I run out. These liners are my go to when I'm out of baking spray. I just place one in the bottom of my cake pan and add batter. Once the cake is done, they don't stick at all. These basic parchment liners work well. What’s not to like? They’re a simple liner that comes out the pan well and is easily pulled away from cakes. These parchment circles fit perfectly into an 8 inch pan. They do exactly what they're intended to do, help the cake release from the pan. They freeze well, and are also great to let small decorations dry on. These little liners have been a lifesaver! Some of my cakes are very delicate, but they turn out quite easily with these. They are really convenient, and this is a great deal! These are extremely convenient to have on hand (I also use them in toaster ovens, if the need arises). They are a tad larger than the inner circumference of my personal 8" aluminium cake pans which is slightly disappointing, but it's not too bad and I don't know that this would be an issue for different brands. I also wish these came in packaging I could actually store the parchment in. No more cutting out parchments circles for me!! These are great. I hesitated when I saw them in the retail store I often buy supplies from, but Webstaurant offers them at such a reasonable price. Work like a charm and such a time saver! These are a great buy. They make baking quick and simple. You never have to worry about sticking and they make cleanup very quick and painless. What a time saver! These Wax parchment liners are fantastic for lining cake pans prior to baking. The cakes release easily from the bottom of the bans with absolutely no sticking. These are a lifesaver. Make any regular pan, a non stick pan. Amazing and shaves a significant amount of time from my prep. Great deal and they come in multiple sizes. Highly recommend. Just like the 6" version, these are a great timesaver, but they tend to be a little large. Most of the time this isn't an issue, but on occasion a certain batter will not work well with the liners. A lifesaver when baking layer cakes. Makes them pop out if the pans easily without them sticking or breaking in half. Always keep plenty on hand. I don't know how i baked cakes without these. I know how -- it took me longer to cut out the parchment paper. A little thinner than I would like, but they are so convenient, I would order again! How many hours of my life were spent tracings cake pans on parchment and cutting out the circles...? It seems like most of the reviewers were as relieved to find these pre-cut liners as I was. The price is awesome and they work wonderfully. These are essential for baking cake rounds - we use them oiled and floured in our 9" cake pans and they work great - easily remove cakes every time. Excellent use of my money! These are amazing! You will never or almost never need to buy the roll of parchment paper again! Loving this product! We make a lot of 8 inch cakes and now we can do it faster - saves a lot of time for our small baking business. Thanks for providing such products at such reasonable prices. Such a great time saver. I love these so much. I use to spend so much needed time on measuring and cutting them out before and these are a lifesaver. This simple product eliminates so much frustration. I have been using these successfully for their intended purpose of lining my cake pans for easy removal, but have also started using them to wrap and roast garlic in! They work wonderfully. These circles are a God send. I was having to cut circles for every cake and that was time consuming not to mention annoying. I can't imagine not having them in my pantry. These parchment circles have been lifesavers! My cakes fall right out of their pans perfectly - no more sticking, no more having to pry them out. Won't make cakes without them! these are great to use in the bottom of pans because I only use the spray I don't like using the flour. so this make it very easy. I'm not a professional baker but I love using these cake circles when baking cakes. They prevent them from sticking and makes cleanup a breeze. I previously used parchment circles and these work the same way. Are much thinner than parchment, though, but still work great. I would highly recommend. Great product with good price in bulk. Very please with the baking result. Will recommend this product, and will come back for these dry wax baking paper. Great buy! I was much happier with these cake circles than my other purchase. I learned that if you want you cake circle to look white even after your cake has set on it overnight, the wax coated is a must. Don't try to save a few pennies. These dry wax cake circles are a life saver. We use them for all our cakes the 8" size being the most used. Keeps our cakes from sticking. Maybe I had the wrong expectation of how these work, but they stick to the bottom of the cake more than I expected and the edge has to be lifted off with a knife and pealed off. I thought they would be more non-stick and more like regular wax paper. The paper is super thin. Thanks for you review! These are designed to prevent sticking between your pan and cake but there is no guarantee that it will never stick. The ingredients in the cake, oven temperature (max 400 degrees F), and length of baking time play a part in whether or not the cake will release easily from the dry wax paper circle. Also, it is best to spray the pan and dry wax circle with pan release before baking. No matter what kind of paper you are using. We sell these in packs of 100. Wehave not had any complaints and have resold to the same customer. They are true to size and work well under cakes. Love these pre cut circles! use them all the time for cakes. -up on the sheet pans and when you figure the cost it is well worht the cost, we will be buying again soon ! I was not to sure about this product when i first purchased it but now i totally love the dry wax cake circles. my cake pan clean up is so easy now! Perfect for lining cake pans. Assures the bottom won't stick and pull off no matter how much pan is sprayed or spots missed. Wished I'd ordered them 5 years earlier! The 8" circles are a tad large for my 8" pans but work well to line in spite of the size difference. They work well in the oven with out issues.